Once we have treated the condition that you came to us with, we want to make sure that you stay feeling good. Maintenance care could be compared to giving your car a service. By providing you with a check-up from time to time, we hope to identify any problems that are building up again, and deal with them before they become painful. How can Exercise Rehabilitation be useful? Research suggests that as a back or neck pain sufferer you can expect your symptoms to be reduced by an appropriate exercise regime. Exercise typically gives people more confidence in their backs enabling them to enjoy a wider range of activities. Regular exercise can also play an important role in preventing a reoccurrence of your condition once you are feeling better. However, there is often the concern that you may do more harm than good by exercising in the wrong way. With this in mind we offer a service to help you get going with a suitable exercise regime. 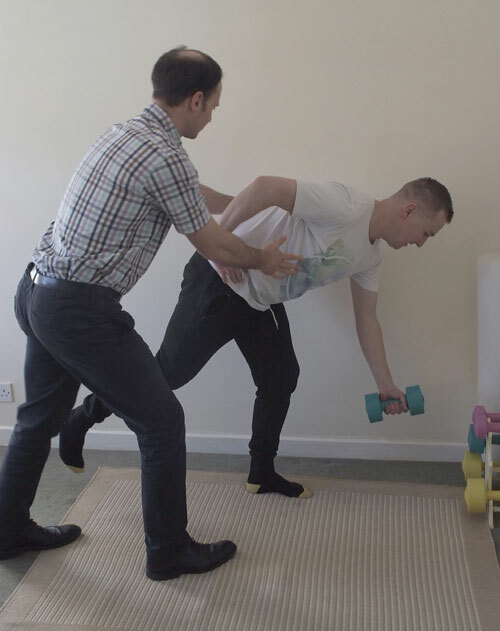 Stuart Robinson, our chiropractor with a special interest in Exercise Rehabilitation, will design a programme of exercises suitable for your needs and supervise your progression towards a stronger, more stable musculoskeletal system. All the chiropractors will provide exercises and offer exercise advice as part of your chiropractic care programme, but some people find that Stuart’s Rehabilitation sessions, dedicated purely to exercise, are a particularly helpful way to focus on their requirements in this respect. You may be someone who exercised regularly before a back or neck injury, and you need help to get back into your old regime. Or you maybe someone who has never exercised before but recognises that improving your physical condition is a way to prevent recurring episodes of pain. Or perhaps you are a keen sportsperson wanting to find a way to improve your performance. For many people, Stuart’s exercise rehabilitation sessions will be a stepping stone to joining an exercise class or returning to previous sporting activities. If Rehabilitation is likely to be useful for you, your chiropractor will be happy to advise you at what point in your treatment programme to book a Rehab session. When you first attend for an exercise rehabilitation session Stuart will analyse your movements to identify any faulty movement patterns, including areas of weakness, tightness and overactive muscle groups. The exercises prescribed are individually tailored to your needs, and are designed to recondition your back, and other problematic joints or muscle groups, whilst avoiding excessive loading on vulnerable areas. For some people one session may be sufficient to point them in the right direction, but generally you are likely to gain maximum benefit by attending for a short course of rehabilitation sessions to build and develop your programme of exercises. Some people like to attend for monthly Rehabilitation sessions as an alternative to Maintenance Care, particularly if they feel that the issues dealt with by the exercises were key to the problem that first brought them to the Clinic.